WCF error: The remote server returned an error: (413) Request Entity Too Large. I created a WCF service to upload XML file data into SQL Server table. This web service is working fine with XML small file data but it has an issue with larger XML file size. I tried several ways to fix it in web service web.config but still stuck in above error. I need helps to setup on WCF configuration to resolve my issue. I just test my web service by creating a simple ASP.NET Web application to call my web service. Exception Details: System.Net.WebException: The remote server returned an error: (413) Request Entity Too Large. The XML file is used for uploading which has 500 KB size. Re: WCF error: The remote server returned an error: (413) Request Entity Too Large. If I run the web service project, the web service look fine but if I call it from consume project for testing it, then above issue is given. Any further help in my case . Thanks. Strange WCF by default limits messages to 65KB to avoid denial of service attack with large messages. To solve this issue you must reconfigure your service to accept larger messages, which it seems that you did. I don't see your endpoint configuration in the config file. Can you show that? Above is my entire web.config. Thanks. What does your client config look like? Please post that as well. Thanks. I spent a lot of hours to try but still display same error. I created simple ASP.NET web application, then add upload web service via Add Service Reference. Thank you for your time to solve on my issue. Thanks. Just return feedback that I got same error. 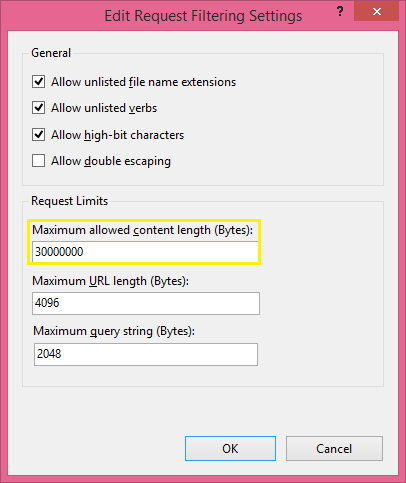 Maximum Allowed Content Length is an Optional U-Int attribute. It specifies the maximum length of content in a request, in bytes. The default value is 30000000, which is approximately 28.6MB. Specifies the number of bytes that a Web server will read into a buffer and pass to an ISAPI extension or module. This occurs once per client request. The ISAPI extension or module receives any additional data directly from the client. The value must be between 0 and 2147483647. The default value is 49152. That might be it, but he'll still have to keep the increased values in his wcf server and client configs. Take a look at Chris's answer. You should try that as well, but also leave your wcf client and server configs with the increased values. If that doesn't work, then I'd try sending a very small file to see if there is some other issue going on. Of course, I tested on XML file small size, I can upload the data into SQL server table without any issue. I am not publishing to the live server yet. I just develop it on VS 2012 tool just local first to make sure it works well. I saw the link that Chris' response and checked it on local IIS. My upload file is under 1MB, less than 1,048,576 bytes. Therefore, default Request filtering Settings is fine to my upload size. Any other idea on setup to resolve Request Entity Too Large? Chunking the request (breaking it up if that is possible) or streaming. "The streaming mode is useful when the information that is passed is lengthy and can be processed serially. Streaming mode is also useful when the message is too large to be entirely buffered"
I tried both TransferMode either Streamed or Buffered but still same error. I am currently using transfer mode is Streamed for WCF web service in web.config. Nothing issue on small size XML file but trying on large file size with your suggestions and my efforts to other setup and config searching but I could not get thru this issue. Had I spent a lot of hours to find the solution but still get stuck. Its really hard to diagnose what the exact problem is on-line. Given that you know a smaller file will work, I suggest you logically break it out and send the file in smaller chunks. I appreciate your suggestion but my web service design that will delete all old records from SQL Server table before uploading new data. I could not solve the above error using VS 2012 tool. Another try is published on Window Server 2012 R2 but still stuck with an vague error : The remote server returned an error: (400) Bad Request. Anybody had experiences to upload large XML file into SQL Server table using WCF web service, please help. You can still logically break out the large file and send the file in smaller chunks. Then create the entire file on the server before deleting / inserting into the database. See the following example in this post (the first one) that goes over file uploading in chunks. Using the same logic, you can also put each logical chunk into a queue and then recomposing the parts for your final database transaction. Generally, sending really large files over the wire isn't the way to go. After long hour found the solution, I got it working now. I just removed bindings name from above section to make your customized bindings configuration to replace the current default. It works like a charm.